Alexei Krasnov is a member of the research group that unites I.V. Piyr, M.S. Koroleva, N.S. Sekushin (Institute of Chemistry, Komi Science Center of UB RAS, Syktyvkar) and M.M. Piskaykina (Ukhta State Technical University (Ukhta). 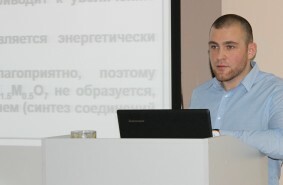 In the report, Alexei Krasnov informed the audience about the synthesis methods’ development of powders of various dispersity and novel synthesized doped bismuth titanate with the pyrochlore type structure. The research group determined the temperature range of compounds’ stability in air and under hydrogen atmosphere and revealed preferential distribution of the dopants in the cation sites of the pyrochlore structure. The scientists found out that doped bismuth titanates and bismuth niobates are promising as mixed electron-ion conductors and protonic conductors at the certain conditions (damp atmosphere and temperature 240-650°С). According to DFT calculations performed by means of VASP, doped pyrochlores are wide-gap semiconductors with maximal light absorptance at the wavelength of 450 nm. The compounds are also promising as materials with photocatalytic activity in the visible light. The cooperation between SCTMS and the Laboratory of Ceramic Materials Science (Institute of Chemistry, Komi Science Center of UB RAS) is based on mutual interests in the development of new solid electrolytes.